In July (2010) Newsweek printed an article entitled The Creativity Crisis. According to the article, research has found, for the first time, a decline in creativity in our country's youth. Although, I don't find this information too surprising, it is disappointing and worrisome as a parent and educator. Here is a section of the article but click on the link above for it's entirety. The article points out that although it is too early to tell the reason for the decline, most likely it is due to the increase of tv and video use by children and the lack of creativity in our public school curriculum which is more focused on things like standardized testing. As parents or educators of very young children we know children naturally abound in creativity. The question is how do we continue to encourage it, protect it, and allow them to use it? Another interesting quote from the article reads: "Having studied the childhoods of highly creative people for decades, Claremont Graduate University’s Mihaly Csikszentmihalyi and University of Northern Iowa’s Gary G. Gute found highly creative adults tended to grow up in families embodying opposites. Parents encouraged uniqueness, yet provided stability. They were highly responsive to kids’ needs, yet challenged kids to develop skills. This resulted in a sort of adaptability: in times of anxiousness, clear rules could reduce chaos—yet when kids were bored, they could seek change, too. In the space between anxiety and boredom was where creativity flourished." Wanting to know what I can do, I searched around a bit. This is a list of ways I can and others, as parents and educators, help save childhood creativity. 2. Provide toys that are more open ended, toys that encourage imagination. 4. Tell stories. Look through photo albums and relate stories about the pictures. 9. Give independence. Don't hover over your child. Creativity is stifled when someone feels they are being watched or critiqued. 10. Accept unusual ideas and suspend judgment. Lastly, a little research of my own. The well known testing method used to test creativity is a test designed and used by Paul Torrance known as the Torrance Test (you can read more about it in the article). 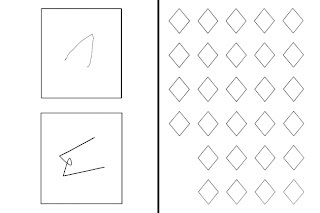 Part of the testing includes a drawing portion in which the participant turns an incomplete line drawing into a picture. After review of the picture, points are given for original ideas and elaboration, with higher points for conveying emotion, a sense of motion or if it tells a story. Points are taken away for more common images like sharks or hats which tend to be the most popular. Here are some examples of the test. I drew the one on the top left for my daughter (who is a bit young for this since it is suggested for at least age five and older), but I was just too curious not to. I gave her the paper and asked her to turn it into a picture. "It is a carrot," she said. I have no idea what I would have made but I never would have thought of a carrot. 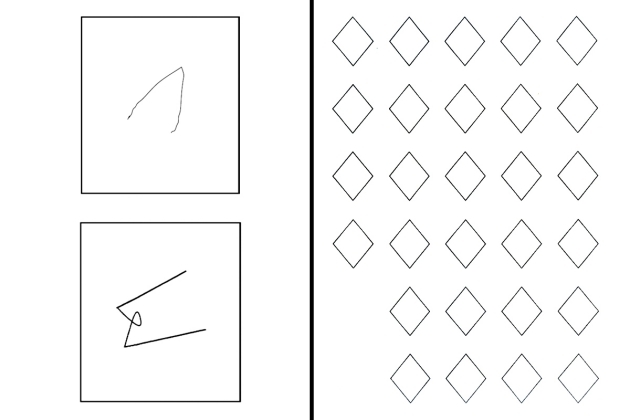 In my research, I did come across the idea that by providing a starting point like the few lines drawn in this test, creativity is used, exercised and encouraged. It makes sense and this is something I would like to try to do more of with our art exploration. Funny how I was just discussing this today with my partner. I have great analytical skills, but never developed any creativity. So this is something I really love to see in my kids. We both agreed we like the way we're raising our kids now, and I hope the new play/workroom with rotating toys and art access will really help not just teach them school things, but also keep them creative. I think it is interesting that anxiety is seen as a positive force in some circumstances. I stand out from my friends by sending my 8 and 10year olds out on errands around the neighbourhood, encouraging independence and resourcefulness and other good things. Sometimes they do get anxious but they sort it out and get themselves home safely. I would never put them in danger but I think we live in such a risk averse world and health and safety are such big issues that as a parent one has to consciously decide to do things outside the bounds of "normal" to give our children properly normal lives. Thank you for sharing this with us! I am always talking about what a gift creativity is to my children, so I am curious to see how they do with the "test". I'm definitely going to link to this on my blog. I found this article several weeks ago and find myself still mulling it over. I loved the list you compiled! It is always so encouraging to see what a powerful impact we can have on our children thru things that are really so simple. I had also never really thought of creativity as embodying both divergant and convergant processes. It is creativity with a purpose! Thanks for the feedback. Annicles- I agree and what a great example that you mentioned, it makes me think what I can do. Deb- thank you so much for the award. Your blog is a such a resource! I am still thinking about this issue and looking for ways to encourage creativity with my daughters, I'm sure there be more posts on it in the future! I wrote a blog post about this article too! Such a great thing to see, especially in such a well-respected, mainstream publication.